One of Donegal Town’s most respected ladies sadly passed away at her home on Castle Street last weekend, much to the sadness of her many close-knit friends who have all spent a lifetime on that street. Aged 92, Betty Meehan was a native of Cornafean, Drumbess in Cavan and even after her 74 years in Donegal, she still retained her proud Cavan heritage. 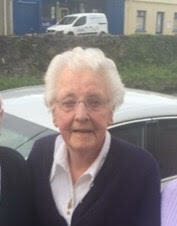 Betty came to Donegal as a young lady where she took up employment in the Great Northern Hotel, then a member of the prestigious Great Southern Hotel Group. Her husband Danny, who is still hale and hearty at the age of 96, had been working in the hotel at the time and a mutual attraction quickly emerged. Danny returned back to his native Donegal town but the relationship developed as Danny pedalled his way on his Raleigh bicycle to Bundoran every Wednesday and Saturday. To Donegal Town people (Townies) Castle Street could be compared to the fictional Coronation Street - everybody knew each other, everybody cared for each other and everybody looked out for each other - a feature that still remains to this very day. Betty was always to the forefront of this community along with her husband Danny as they reared their seven children. Betty also had a great love of music and in particular the traditional and ceili genres associated with her native Cavan. She did make one exception however, and would have included our own Daniel in her top three all time favourites. At her funeral mass the music of Cavan was indeed very evident when Brian and Geraldine and their children coming up from her original home bringing with them the music of the Cornafean Ceili Band which was performed at the celebration of her life on Monday last. Betty was indeed a real family woman, a great mother and a woman who enjoyed the company of her husband Danny for 74 years right up to the day she passed away. The funeral mass took place on Monday last in St Patrick’s Church, Donegal Town with burial immediately afterwards in Clar cemetery.